PHILADELPHIA—The Mill Creek section of the city was the site of the infamous 2000 “Lex Street Massacre,” Philadelphia’s worst killing spree in modern history. It is in this area that the men of the Fruit of Islam (FOI) in the “West Squad” of Muhammad Mosque No. 12 decided to establish a community service project. 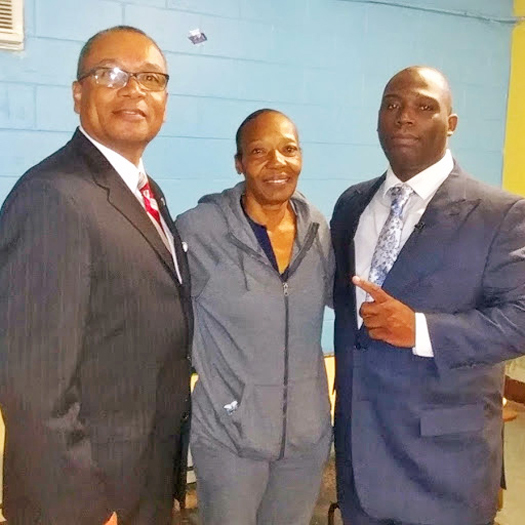 According to squad member and assistant student secretary Rodney Muhammad, three years ago the squad approached Ms. Denise Cary, a rec specialist at the Mill Creek Recreation Center and asked her if the FOI could be of assistance and a bond was formed. “This has been a project that the Honorable Minister Louis Farrakhan had asked us to do regarding getting involved and cleaning up our community. So, the West Squad decided to come to Mill Creek and help sister with the redevelopment and cleaning up of the community here. We have seen the potential of being a beacon for what is needed in Philadelphia,” Bro. Rodney Muhammad said. The brothers were given an award from the center for their efforts at a back-to-school supplies give away that was held several weeks ago. In an interview with The Final Call, Ms. Cary said the recreation center is a second home to 225 children who are economically and spiritually deprived. It is a safe haven where the children learn to be constructive young brothers and sisters. “The brothers (FOI) have been instrumental in coming out and talking to the young men, showing them there is light at the end of the tunnel. The brothers bring in an awakening that there is another way. The young men in the community look forward to seeing them and talking with them and that was not always the case,” said Ms. Cary. On the day of the interview, the West Squad was hosting a leg of the Stop the Killing Tour under the direction of Student Assistant Minister Lamond Muhammad at the center. He spoke before a packed house on a late Sunday afternoon. Afterward, a full course meal was served to those who came out.